Well, Immerwulf was just so amazingly done that there was no other choice. Lumberjack and Ukiyo could both have won in other rounds, as they are both awesome as well. Definitely one of the most competitive rounds since I've been here. 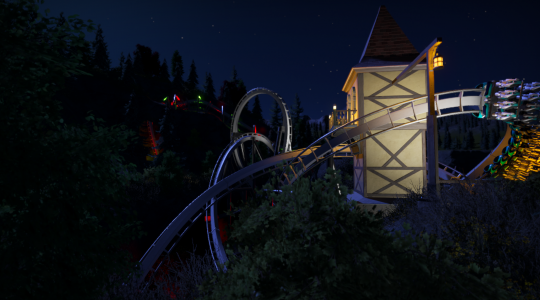 I'm a big fan of all the RCT2/RCTC work entered in this round, great work! I don't think that Flat Woodie Farm could have won out of the three isometric entries we have, but it is certainly leaps and bounds ahead of most of the RCTC work we get in the competition. Adding more context around the ride would certainly help to bolster your entry's chances in future rounds, try to make it look as though it's part of a park. Lumberjack's layout looks great and I really like the little details put into the area around the ride, such as the transfer track. Ukiyo looks good although there is something about the screenshots that is a bit off-putting to me... perhaps it's the completely black nothingness in the background of some of the screens where it looks like there should be something. I really liked Flat Woodie Farm. It's hard to put four loops into a wooden coaster without it getting over intense or high in nausea. The other coasters are beautifully done, but I can't plop it into one of my parks like I can with the Flat Woodie Farm. I maybe would of liked it in more of a sci-fi themed scenery, but I still love all the elements that this ride has accomplished. Hello all! Looks like a great round! Wow! I've been waiting patiently for this creator to enter a PC project and it was well worth the wait! This ride looks exciting and well thought out. 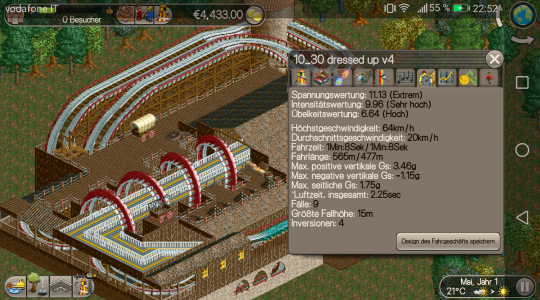 The theming goes great with the layout. The lighting is on point. The overall smoothness just adds to its realism. I love it and it got my vote! Well done sir! Awesome concept, I love the queue going through the loops! The compact design allows it to be placed in many different park layouts. Great job! I love wooden coasters and log flumes especially when they're in close proximity to each other. This park looks great! The airtime on those first two hills would be a lot of fun! The colors stand out brilliantly! This was my pick for 2nd place. The scenery is absolutely beautiful! If it weren't for ImmerWulf this would have won in my opinion. 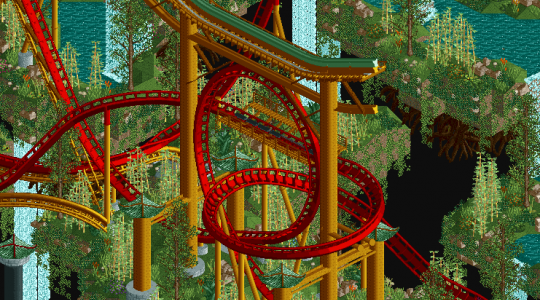 Fantastic round for both PC as well as RCT2! Flat Woodie Farm is impressive from a gameplay perspective. 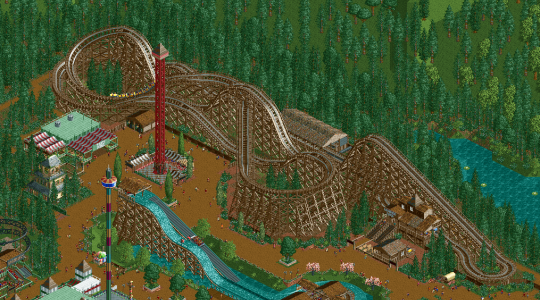 Pretty cool for an RCT:Classic entry. Lumberjack is quite phenomenal in the simplistic style it uses. No fancy tricks, just a very by-the-book entry that is very effective in its aesthetic choices. Such a treat to look at. It's certainly between Ukiyo and ImmerWulf for me too. It's hard to decide which one I like more, but I'm leaning very barely towards Ukiyo right now. Amazing round, wouldn't wish for either to lose honestly lol, so much effort in both of them.